Do You Really Understand IQ Test Scores? Have you ever wondered how IQ testing is used to determine whether someone is a Genius or is Mentally Challenged? You are not alone. People have been trying to measure intelligence in children and adults since the early 20th century with various methods of testing. While intelligence is an abstract concept that can’t truly be defined or measured, psychologists have devised Intelligence Quotient (IQ) Tests that can determine a person’s mental capability. The resulting IQ test scores are used by professionals in a wide variety of disciplines and professions to diagnosing various issues and identify an individual’s potential in specific areas. Educators, Employers, Criminal Psychologists, Psychologists, Social Scientists utilize IQ tests in a variety of forms. Most are used to diagnose mental illness and learning disabilities, however some are used as predictors of an individual’s tendency toward certain abilities. Measure verbal intelligence such as vocabulary and comprehension. Measure non-verbal intelligence such as performance on tasks, formulas etc. Assist parents and teachers in determining a child’s educational course. Help teachers identify students with learning difficulties so that appropriate interventions can be applied. Help teachers identify gifted students so that more challenging educational pathways can be devised for them. Determine whether an individual is capable of handling college level academic work. To assist career counselors in prescribing a career path for an individual. Indicate if an individual will perform well in an employment-training program. Assist employers in determining potential leaders. Determine whether an individual is competent enough to stand trial in a court of law. Diagnose low cognitive functioning or mental impairment in an individual. Assist doctors in determining how well the brain is functioning after an injury and in the early diagnosis of Alzheimer’s disease. IQ Test Scores are utilized for a wide variety of purposes but few people actually understand them. What are IQ Test Scores? What IQ tests actually measure is a subject of much debate among research, education and psychology professionals. At the heart of the controversy is the actual definition of intelligence. There has never really been a commonly agreed upon definition of intelligence. If you rounded up every psychologist, educator and researcher I the country and asked them to define intelligence, you would get hundreds or thousands of different definitions. Therein lies the problem. Without a clear definition of intelligence, how can it be measured? Contrary to popular opinion, IQ Test scores are not a measure of intelligence. Additionally, your IQ test score is not a guarantee of how “smart” you are, how well you will do in school, or how well you will perform on your job. While it can be used to predict those things, it is not an absolute guarantee. IQ tests are cognitive measures and do not typically include measures of non-cognitive elements such as personality, motivation, conscientiousness or perseverance. Yet those non-cognitive elements can have a significant influence on your grades, job performance and ultimate success in life. The majority of research, educational and psychological professionals agree though, that IQ Tests measure an individual’s mental ability and agility. IQ Test Scores are the result of the tested measurement of a person’s cognitive ability to think and solve problems. A person’s IQ Test Score shows what a person is mentally capable of at a given point in time. Just as a person’s body grows over time, a person’s intelligence also grows over time. A person’s IQ Test Score is not a stagnant, permanent, fixed number. An individual’s IQ Test Score can change due to their exposure to grade school, high school or college education, various life experiences, and changes in the environment around them. A child that is tested at age 10 will not likely have the same IQ test score at age 30 or even age 50. IQ Test Scores are not a perfect measurement tool because IQ tests are man-made and testing instruments cannot test all of the various elements that can affect a person’s intelligence. While some IQ test are better than others, all intelligence tests have flaws. For instance, most IQ tests do not take into account differences in language, their originating culture or, the socio-economic conditions they were raised in. The majority of intelligence tests are written multiple-choice tests with questions that are answered by blackening in the circle that represents the letter of the correct answer choice. How an individual interprets what the question is asking for has a large bearing on how they answer the questions, which in turn affects the resulting IQ test score. An IQ test score really is just a result of testing that measures a group’s or individual’s potential based on their cognitive functioning level at the time they took the test. Perhaps what is more important than what an IQ Test Score is, is what an IQ Test Scores is correlated with or what it reflects. For example, an individual child’s IQ test score compared to other children’s IQ test scores can help determine what type of educational setting is best suited for the child to learn in. A child with a profoundly low IQ test score may not be best served in a regular public school classroom. By the same token, a child with an extremely high IQ test score may be better served in a classroom of like IQ peers rather than a regular public school classroom. In an adult, a person’s IQ test score compared to other adult’s IQ test score in the same age range can be utilized to determine what type of employment positions they are capable of. A person with a low IQ test score may be better suited to an employment position that relies more on manual strength, stamina or dexterity. Conversely, a person with a higher IQ test score may be better suited to an employment positions that require higher level thinking abilities such as management, engineering, research etc. There really isn’t just one specific way to measure IQ. There are a variety of tests that have been devised to measure IQ both in a group setting and on an individualized basis. All tests of IQ consist of measuring an individual’s mental abilities in comparison to others in similar circumstances or age ranges. However, there are two primary tests of an individual’s intelligence that are considered to be the most widely used tests, the Stanford-Binet and the Wechsler. Perhaps the most commonly known IQ Test is the Stanford-Binet, which is widely used in IQ testing of children and young adults. 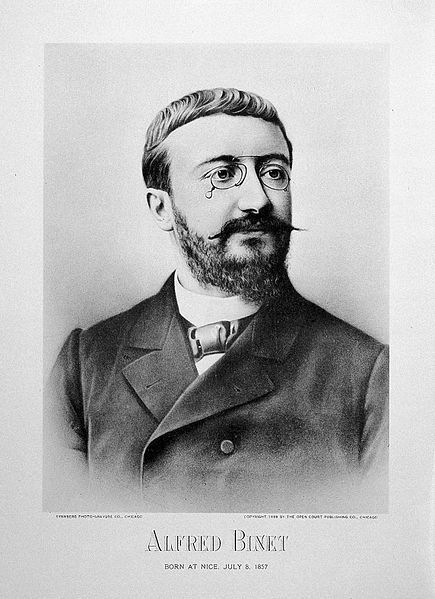 French psychologist Alfred Binet is credited with developing the first valid Intelligence test in 1904 in order to separate normal intelligence children from inferior intelligence children into separate government schools where each child would receive the appropriate individual attention they needed. Some years later, Henry H. Goddard translated the French Binet test into English. In the early 1900’s the test was used to test children’s basic intellectual functions in U.S. schools and in psychiatric clinics to diagnose mental health issues. The U.S. Army even utilized it during World War I to determine the intelligence and abilities of new cadets in order to determine if they were fit to enlist and to place them in the best positions for their mental abilities. Others expanded on and revised Binet’s work until Lewis Terman’s revised Binet IQ test developed at Stanford University became the standard IQ test adopted in the U.S in 1916, known as the Stanford-Binet Intelligence Scale. Terman was a noted pioneer in educational psychology and joined the faculty of Stanford University in 1910. Lewis Terman was fascinated with the study of genius and gifted children. He believed that the IQ was not dependent only on education, but was in large part influenced by a person’s genetics and heredity. He purported that the purpose of testing should be to identify intellectually gifted children, as they were the potential leaders of society. His revisions to Binet’s IQ Test included the “Intelligence Quotient” which took a person’s mental age (the age which they mentally performed at) and factored it into their chronological age. The “Intelligence Quotient” became the index which a person’s IQ was measured against. The Stanford-Binet IQ Test was introduced in 1916 and since the 1920’s; it has been the most widely accepted method of testing intelligence in children and young adults. The test can be administered to anyone age 2 through 85. 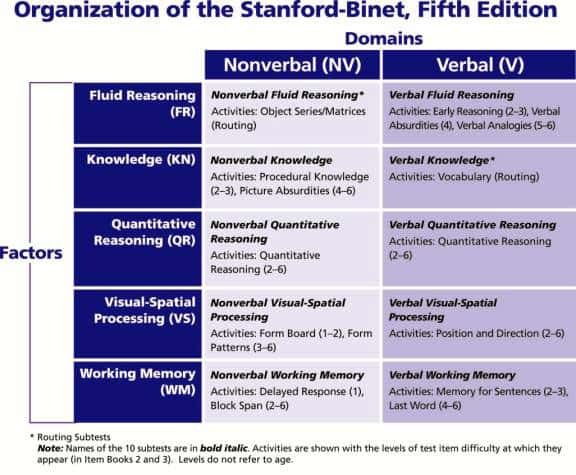 The following table shows the Stanford Binet IQ Test components. 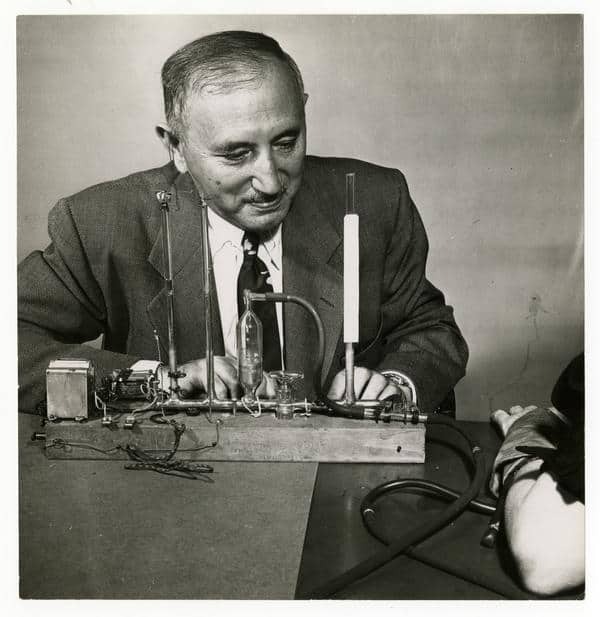 David Wechsler, An American psychologist, developed the Wechsler Adult Intelligence Scale (WAIS) in 1955. Wechsler wanted to assess intelligence, knowledge acquisition and understanding. His theory was that a person’s intelligence is made up of several specific and interrelated elements that can each be isolated and measured. He proposed that the Binet test was oriented more towards children rather than adults because of its emphasis on speed and timed tasks. The Binet test did not take into account that certain non-intellectual variables could affect the intelligence scores and that intellectual performance could deteriorate as a person aged. The WAIS is the most commonly used IQ test for teens and adults in the world and is administered to anyone age 16 through 90. The following table shows the WAIS IQ test components. Ratio IQ Score: IQ Test scores were determined by taking the age at which a person operates and dividing it by their actual age and then multiplying that by 100. For example, if a person can do the work of someone who is 25, but their chronological age is 20, their IQ would be 125 (25/20 X 100 = 125). Percentile Scores: The most commonly utilized IQ test scores are set at a mean (or average) of 100, with a standard deviation (or average difference) of 15. The scores show how the test taker’s performance compares to others tested and are expressed as a percentile. A test taker that scored in the 60th percentile performed as well as 60% of all of the test takers in their age range. While the Ratio IQ score was the historical means of calculating one’s IQ score, the majority of modern IQ tests utilize the Percentile Score (also referred to as the Deviation IQ score). What Does Your IQ Test Score mean? Your IQ Test Score by itself does not really mean anything. It only has meaning when it is applied to a purpose and in relation to other people’s IQ test scores. It is the result of the testing of your logical reasoning and mental problem solving skills. Unlike previous generations, our world has become increasingly dependent upon complex problems and systems, informational services and products, abstract concepts and real time communication. Functioning in such a world requires higher knowledge, learning ability, problem-solving ability and reasoning speed. Although IQ test scores were originally considered to be predictors of scholastic achievement, they have gained increasing significance as a predictor of many other things. In several research studies, IQ test scores have been found to be a good predictor of a person’s academic achievement, life expectancy, employment performance, health, socio-economic status and inclination towards crime. The IQ Scales for both the Stanford Binet and the Wechsler IQ Tests provide some interpretation of your IQ score in terms of how your IQ compares to others who took the test i.e. Average, Above Average, Below Average. Neither of the IQ tests has a labeled classification for “Genius”, “Normal” or “Mentally Deficient” because these are more subjective terms. Instead the classifications are labeled as a numerical reference such as “Above Average” or “Below Average”. A normal IQ might be equivalent to Average or Above Average. Roughly 50% of population’s IQ Test scores are Average or Normal, so the mean, or numerical average, on the IQ Test is determined to be 100. If your IQ score is 105, then you are in the average intelligence range along with 50% of all of the test takers in your age range. 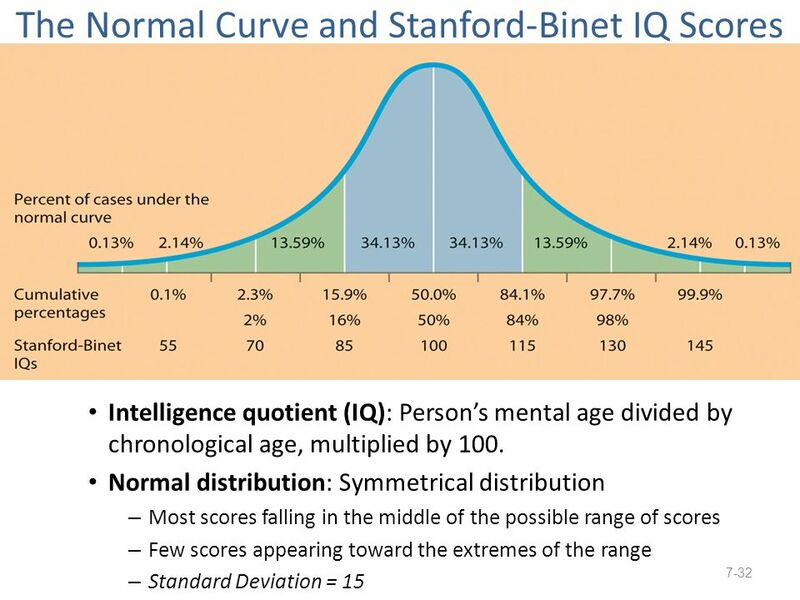 The IQ scores (ranges) from the Stanford-Binet (SB5) intelligence test are shown below. Only about 5% of the population has a Stanford Binet IQ Test Scores below 70 or above 130. 68% of the population has a Stanford Binet Test score between 84 to 116. The IQ scores (ranges) from the WAIS-IV intelligence test are shown below. 2.1% of the population has a WAIS IQ Test score above 130 (Very Superior). 14% of the population has a WAIS IQ Test score in the 115-130 range (High Average to Superior). 60% of the population has a WAIS IQ Test score in the 85-115 range. 16.1% of the population has a WAIS IQ Test score below 85 (Below Average). 2.2% of the population has a WAIS IQ Test score below 69 (Extremely Low or Mentally Impaired). Great care must be taken in the interpretation of the meaning of an individual’s IQ Test Score. Identifying an individual as gifted or mentally impaired may help teachers and school systems to provide resources for those students that require them the most and tailor their educational methods to best reach these students. However, labeling students can also be harmful. A child labeled as mentally impaired or learning can be separated out of a regular classroom and placed into a special education classroom where the work is less challenging, which ultimately alters their pursue advanced education or seek specific types of employment. Alternatively, a child labeled as gifted can be separated out of the regular classroom and placed into an advanced placement course of study where the work is significantly more advanced than in a regular classroom and students may be required to work at an accelerated pace. Overgeneralizations of correlations between IQ test scores and gender or race have historically been clouded in controversy as many researchers and psychologists have challenged that IQ test are culturally, racially, and linguistically biased. While no study has proven that any particular race or culture of peoples have higher or lower IQ test scores than any other, in school settings, people from other cultures that speak languages other than English do tend to be more frequently placed in special education classes and less frequently placed in gifted classes. This issue of bias is difficult to resolve as IQ testing is not conducted in every country so it is often difficult to determine whether an individual score low on an IQ test because the learning disabled or mentally impaired or because they come from a different socio-economic background where they were deprived of education or resources. Many people have misconceptions of what IQ Test Scores mean. IQ Test Scores are not magic crystal balls. They are not prophecies of what a person’s future will be or what they will do or achieve during their lifetime. Thomas Edison, inventor of the electric light bulb, had an IQ Test score of 100. Richard Feynman, winner of the 1965 Nobel Prize in physics and quantum electrodynamics had an IQ test score of 124. Bob Dylan, famous folk and rock musician had an IQ test score of 106. President Ronald Reagan had an IQ test score of 104. IQ Test Scores are not a determinant of a person’s worth or value. A person with a high IQ is not guaranteed to be wealthy or successful, just as a person with a lower IQ is not guaranteed to be poor or a failure. Ted Kaczynski, the Unabomber, had an IQ test score of 167. Jeffrey Dahmer, Serial Killer, had an IQ test score of 144. Mariah Carey, famous singer, had an IQ test score of 95. Tito Ortiz, a former UFC champion, had an IQ test score of 90. Andy Warhol, famous pop artist, had an IQ Test score of 86. Muhammad Ali, word famous boxing champion, had an IQ test score of 78. How to test your IQ? As we mentioned earlier, the two most commonly used IQ tests are the Stanford Binet and the Wechsler Adult Intelligence Scale (WAIS). Depending on your purpose for needing an IQ test, there are several ways to get your IQ tested. Licensed psychologists or school psychologists can administer and evaluate IQ tests for purposes of clinical or educational learning issues diagnosis. Occupational therapists or social psychologist can administer and evaluate IQ tests for the purposes of occupational or social service placement. Public school systems utilize standardized IQ testing to determine a child’s abilities relative to other tested in their same age range. What is the highest IQ test score? According to the Guinness Book of Records, the highest IQ test score ever achieved was by Marilyn vos Savant, who score a 228 at the age of 10. However, it is rare that an individual’s IQ score would be above 140. Only 0.5% of the population has scored above 140 on an IQ test.